Beyond Baby Talk: A giveaway and a call for your questions! You can’t be a parent and not be fascinated with development. A child’s growth – from newborn to toddler and into childhood – it’s such an incredible transformation. It’s quite a privilege to witness it, and from the front row, too. During the first year, I was most interested in Cee’s gross motor development. I loved watching her move her body in deliberate ways, from the way she turned her head away from something too stimulating as a newborn to sitting up for the first time, to pulling up, cruising, crawling, and then boldly to walking, climbing, and running. Now, nearing her second birthday, the most fascinating development frontier for me is Cee’s language. She surprises me with new words everyday. It’s exploding. I’m super excited that Drs. 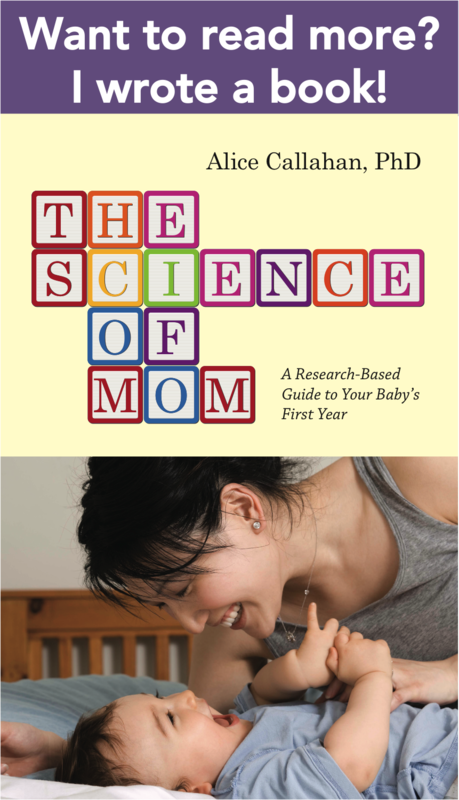 Apel and Masterson have agreed to do an author interview with Science of Mom readers, answering your questions about language development. Just leave your question in the comments below, and the Beyond Baby Talk authors will answer several of them in a follow-up post in a couple of weeks. Plus, we’ll also be giving away a copy of the book! 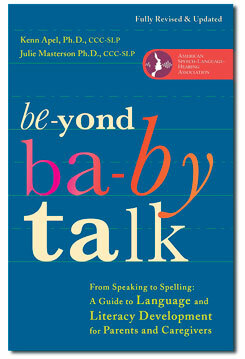 Now, let me tell you a little about Beyond Baby Talk (but let’s call it BBB). The first half of BBB chronicles language development from infancy to the early school years, describing major milestones and transitions and offering suggestions for how parents can encourage their children’s development. The second half of the book covers topics like the influence of gender, birth order, culture, media (ahem, television.. and texting), and childcare on language development. The final chapter is on what to do if you suspect a language delay. It’s all well-organized for finding quick answers to your questions, and it’s written in accessible language. You don’t need a graduate degree to understand this book, but as someone with a science background, I appreciate the reference list in the back of the book. There’s also a chapter entitled, “Fads, Scams, and Myths: Knowing What to Look for.” Spoiler alert: No, you shouldn’t try to teach your infant how to read or run your toddler through language drills. Your child will learn to speak and eventually read and write without special gadgets or programs. She’ll learn through conversations with you, by reading with you, and by watching you model reading and writing. What I most appreciated about this chapter is that it provides a handy guide on “Being an Informed Consumer of Information.” Apel and Masterson describe how they judge the quality of evidence, what peer review is all about, and how to evaluate an advertised product, method, or claim related to language development. I would venture to say that this guide would be helpful in evaluating the quality of information in just about any area of parenting, so I think that it is fabulous that they included it. Since Cee is almost two, I was of course most interested in the toddler chapter. And reading this chapter made me realize just how much fascinating stuff was happening right under my nose. Most toddlers begin using 2-word sentences around 2 years of age. (This happened a couple of months ago with Cee and many other toddlers I know, but as with anything in development, I’m sure there is a broad range for normal.) At this time, Apel and Masterson write, most toddlers will be speaking 30-50 words. By their 3rd birthday, they use more than a 1000 words, and of course, understand probably thousands more. In other words, this coming year is a big one for language development. The book introduced me to a few milestones in toddler language development that I might otherwise have hardly noticed. For example, it turns out that one of the first uses of grammar is often word endings, like saying “doggie barking” instead of the simpler “dog bark.” Cee just started doing this! These developments are often subtle to us parents, who are around our kids day after day, but they represent big leaps in the understanding of language. In the chapter on toddler language development, Apel and Masterson write that toddlers seem to master the importance of context in the use of the words me/you, mine/yours, and here/there (all words whose meaning change with the speaker) without much effort, which is quite impressive when you think about it. I was interested in this because Cee actually struggles with this concept. For example, if I say, “Cee, can I help you put your pants on?” she’ll reply (quite emphatically, I will add), “No, YOU!” She wants to do it herself, but she calls herself “you” because that’s what we call her. This concept is nearly impossible to explain, much less to a toddler. Any attempt quickly turns into a “who’s on first” type of conversation. I guess Cee is a little behind the curve on this one, but I’m sure she’ll figure it out eventually. In the meantime, it is left to me to speculate if this represents a deficiency, a hidden sign of genius, or an indication that she’s just a very literal kind of person. As parents, our most important role in language learning is to model the use of everyday language, which simply means talking with our children, beginning on the first day of life. Apel and Masterson advise that we be careful that our language interactions don’t start to feel like lessons or chores or ways to gain approval. Playtime should be playtime, using natural opportunities to make observations. So, resist the urge to drill your little ones: “What color block is this? How about this one? And this one?” Instead, keep it real: “I’ll add this green block to our tower.” In the case of understanding color, Apel and Masterson describe it as a very complex concept, that it takes time to learn, and that drilling your child runs the risk of turning something fun and fascinating – learning how to describe the world – into a chore. All of this is good news for parents. We can enjoy talking and reading with our kids, trusting that their language will develop as they begin to organically master these complex concepts. And if you’re concerned that your child isn’t meeting developmental milestones, this book has some tips for you, too. I admit, when I first opened this book, I thought it might be a bit dry. But it turned out that the topic is fascinating and the writing engaging, and it just made me want to learn more. BBB addresses lots more topics that I’ve always wondered about. Do boys and girls learn language in different ways or at different rates? How about first children vs. their little brothers or sisters? How does bilingualism affect language development? How do I choose a good childcare provider with language development in mind? I’ll definitely revisit this book as Cee continues to talk up a storm! OK, so now it’s your turn! What do you wonder about language development? Leave your question as a comment below for the opportunity to have the BBB authors answer it, AND you’ll be entered to win your own copy of the book. If you don’t have a question, you can enter the giveaway by just leaving a comment somehow language related – your child’s first word, latest verbal triumph, or cutest recent kid quote. Giveaway closes at midnight on November 21, 2012. My guy is only seven months right now and making lots of dada sounds. He also loves to “growl”. I am not sure where he got this but it makes us laugh quite a bit. This book sounds like a great guide for a first time mom trying to understand if her child’s speech development is normal and on schedule. On a side note I nominated you for a Liebster Blog Award in my post today if you would like to read it. I grew up in a household with early intervention specialists. It is never too early to get screend for intervention. Let the specialists determine if the tools they have for that age group will be beneficial. Get a screening at a place that doesn’t provide services. I agree – it seems like it can’t hurt, especially given his early history. I would just be sure that you keep the screening fun and try not to convey any anxiety to him about it. Fascinated by language development! I’m curious about accents. My husband has a thick Boston accent and I have a more neutral one. Wondering who our daughter will imitate? This is a very cool question! I suspect accent is more influenced by culture and community as many friends who are childen of immigrants lack a noticable accent. I had lived in another country for a year at age 12 and came home with an accent that faded over a few months. Oh, I almost forgot my own question: WHY are babies so fascinated with talking on the phone?! I don’t spend much time on the phone – really just a few calls per week to family members, but Cee has been fascinated with grabbing them and “talking” on them from the time she was 7-8 months old. And the phone talk is SO animated and conversational, it’s like she’s trying out sounds and expressions that she doesn’t even use in her speech with other people yet. Where does this fascination come from? My son’s first word was Mum! I was/am so happy even though he says Dada way more now. Why Did Baby Said “Dada” First? Some babies prefer to say words that have the “d” sound in them. There is a somewhat complex scientific explanation for this; however, it mainly comes down to the fact that it’s easiest to make sounds that involve the tip of the tongue touching the roof of the mouth like “d” and “t.” Coming in at a close second is the class of sounds that are made by putting the lips together (e.g., “m” and “b’). 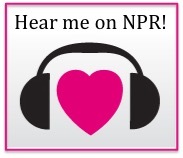 So, moms take heart – you may hear “Mama” anytime now! My daughter is 14 months old this week. Being an avid reader myself, i have tried to read to her starting at a very young age. She’s never seemed to be too interested in the reading part so much as wants to take the book and flip through the pages herself, push it around on the floor, etc. I usually end up just letting her go, and try to talk about the pictures and give an overview of what’s on the page. She seems to really enjoy books, and I “catch” her looking at and “reading” them to herself fairly often (hooray!). I guess I am just wondering if there is a way to get her to read with me or if you think this is something that will just happen as she gets older? What gets more bang for the buck– variety or repetition? Should I be singing the same songs over and over or always surprise the baby with new songs? The other day we were both eating yogurt and she looked at me and held up her cup and said, “look mommy! Sames! !” She is so funny. My question is how do I encourage the same level of conversation and interaction with my 6 month old son, as we have done with my daughter? It seems like the conversations I used to have with her are now drowned out by her new, and ever expanding world of language, and I feel like he is being left out!? Our 5 month old son has a 5 year old half brother who (rightly so) calls me by my first name. I won’t be crestfallen if my little one calls me by name, but I can’t wait to hear him say ‘mamma’. How do we get there without forcing it? Yes, I agree, what is it about phones!! here it’s the same, we are not big phone users, and I hardly ever have a long phone conversation anymore, but boy does our 19 month old enjoy to pretend she speaks on the phone! she even grabs any type of object and pretends it’s a phone and speaks, and now also pauses and seems to pretend she’s listening before starting to talk again! But here is my own question. I speak german to my daughter and my husband french. Our baby sitter (who looks after her 1-2 mornings a week) also speaks french to her, but she spends most of her time with me. She is now saying certain words in french and some in german, but quite obviously understands much more german than french. For me, it is really important that she learns german, what are the chances that she will be able to speak it as fluently as me if she continues to spend most of her time with me? What would happen if, let’s say next year after she turns 2 I started sending her to a french speaking daycare a few days a week, would it put the german she’s learned at risk? I wonder because my sister also speaks to her daughter in german, but she has been going to daycare (in french) since she was 1, and at now 4, she doesn’t speak any german anymore, and only understands it partially… is there a critical age for this? (ps, I live in Canada so I don’t expect to be eligible to win the book, but am greatly interested in this subject). Thanks for your fabulous question! And yes, I think we’ll have to limit the giveaway to the U.S., but I’m glad you left your question anyway. I think this is a fantastic post (thanks for the input on the book, Alice! ), and I really appreciate the other parents’ comments and questions, too. My ten-month-old daughter says “Da-da-da” repeatedly, as well as “Mom-mom-mom” (usually when she feels momentarily distressed for whatever reason), as well as various iterations of those basic sounds (e.g., “Nan-nan-nan,” but not often enough for her uber-loving grandmother’s satisfaction!). But the vocalization that I find most interesting and funny is her hilarious ‘yodling’ sounds. I cannot link them to a particular activity or situation, and I can hardly impersonate those sounds – and when I try to, my tongue feels tired. She rolls her tongue around and around while producing a sound, and every single time, I always giggle at the resulting sound – the novelty never wears off! I’m wondering if this is common among babies in the early months of attempted ‘speaking’ (I lack the linguistic vocabulary to describe what I mean). It also seems to me that she becomes particularly ‘chatty’ when she is exerting herself physically (e.g., when she is practicing ‘cruising’). I’d be curious to hear other moms’ experiences with these phenomena, as well as the authors’ thoughts, if they feel so inclined. Hmm, this does sound familiar – the chatting while cruising part. If I remember, Cee was a quiet cruiser when she was just starting out, but once she got comfortable, she did a lot of babbling while she was moving her body. My 17month old Son seems to be much more interested in sounds than words, for example Mooooo for cow, sssssss for snake, vvvvrrrrrtttt for elephant. He loves to make these sounds over and over, but he makes no attempt to try to say Cow, Snake or Elephant. I was wondering if this was normal? P.S. I love love love your blog! Thanks! And what a fascinating question! I would think it is quite OK. My daughter is 35 months with a large vocabulary and very chatty. When she was first learning words there were lots of animal sounds: baa, moo/mrr, arf, sss, meow & thankfully mum-mum, dad-dad. We even wrote them in her baby book! So what about sign language? I do not drill my 12 month old son but I do sign to him whenever I talk to him. I notice he stares at my hands when I sign to him. At this point he has yet to sign back and I’m sure we are still trying to work on those fine motor skills in order to use our hands. But I heard and have bought into that sign language helps to alleviate frustration on the parent and the child’s side. Oh, this is such a great question. I would love to hear the authors’ take on this. I don’t remember seeing anything about it in the book, so I hope they tell us more! I have heard the same thing and did find some signs really useful in about the 10-18 month range. I know there are a few websites about baby sign language, but is there one (or a couple) that you recommend in particular? Or a book? As a Speech Path for 35 years I found it absolutely works . I haven’t written a book but I wished I had used it with my own children. We used it with my grandson and WOW incredible in promoting language development and speech much faster. Great post! Living in Germany, I’m probably not eligible for entering but I do have a question that I’ve been wondering about for a while. Is baby babble different depending on the language they are surrounded with? In other words, from listening to a baby babbling could a linguist tell that this baby is raised bilingually or in another country? My question is about my own experience. When I was 4, my parents moved to Japan (my dad is Japanese). At the time, my mother and I spoke no Japanese. They enrolled me in Japanese nursery school, and I was silent for 2 or 3 months. Then, one week, I could speak fluent Japanese! (And expressed bewilderment that my mother couldn’t, which made her feel great). A year and a half later, we moved back to the US, and I forgot how to speak Japanese almost as instantly as I picked it up. How did this all happen? Another fascinating question. There is a lot of interest here in bilingual learning! Two of my questions (variety vs repetition and signing) have already been asked… 🙂 So I guess I’ll just comment that I’m really loving hearing my son’s voice; he’s 8.5mos and loves to chatter away to himself and to us, in sentence-like cadences and nonsense syllables, and it’s just about the cutest thing I’ve ever seen/heard. I’m a speech-language pathologist so this is right up my alley. Needless to say, I’ve been closely watching my little guy’s communication signals since he was born: from eye gazes, to differential cries, and now, at 11.5 months, to his babbles slash strings of nonsense words. In our field, we talk a lot about facilitating speech/communication, not so much teaching. We have so much fun encouraging language by playing and engaging in interesting activities. The authors extremely respected in our field and I’ll definitely pick up the book to have a read soon. Thanks for the review. I like your way of describing language interactions as “facilitating” rather than teaching. In my interpretation of the book, I didn’t mean to come down too hard on parents trying to teach language and communication skills. I just really liked the idea that we don’t have to specifically *teach* so much as model and interact, as you say. There are so many ways to incorporate language into play. Children want to learn language – it is clear from the start that they want to communicate! My question surrounds language with the second child & the impact that has. My oldest is 2.5yrs & my baby is nearing 7 months. I’m keenly aware that I don’t speak to the baby as I did my first due to side-bar conversations I’m forced to have with the 2.5yr old. Often, the 2.5 year old demands I not talk so she can “read” books (from memorization) to her sister or just simply talk to her. Its very cute, but I wonder if the baby will learn slower or differently when my 2.5 year old speaks to her rather than me. Obviously, my 2.5 year olds language is not perfect (ie. she loves to refer to a single person as a “people” and more than one person as “peoples”). My 2.5 year old’s language development garnered remarks even from my pediatrician, so I really hope that my baby is able to develop in a similar manner (oh no, I’ve gone and “compared” my kids!). So will the balance of my language in combination with my speech in combo with my 2.5yr olds impact her (negatively)? PS – I note I’m not the only one awake & replying at 3:30am…see, this is what I do while I nurse my baby in the middle of the night…read! That’s the upside of nighttime feedings – and I’ll bet you even appreciate the quiet sometimes with a 2.5 year-old in the house! We are raising our son bilingually. He’s still an infant and just getting his vocal cords warmed up, but I have wondered how it will be when he is school aged and starts learning grammar, writing, spelling, etc. Are these skills universal? Or will he need to learn the concepts for each language separately? My daughter is just shy of being 4 months old, so she’s still in the adorable cooing stage. Never the less it fascinates me that she has already figured out how to use our voice to communicate with us. She makes very different noises when she’s annoyed with something than she does when she’s happy with something. Definitely makes my life easier! How wonderful that you’re already communicating so well! My 10 month old seems to especially love music and singing songs. We sometimes play “drums” (a box with wooden spoons) together in the floor and he is most excited by it when I sing loudly while we play. Can I encourage more language development through song and music or would that soon become more drill-like and take the fun out of it? Also, are there any risks to doing too much singing with him? Could this make words more difficult to understand and speak correctly in the long run? I am from NZ and my husband from the US. What kind of accent will our baby have? In the long run, he/she will almost certainly end up with the accent of the other children around him/her. Where do you live? My son is almost thirteen months old, but he has been quite chatty since birth. I noticed in play groups that he vocalizes much more than any of the other children. This includes children who are both older and younger than he is. He can mimic the sounds I make for example the ‘s’ sound in circle or the ‘t’ sound in tomato, but he hasn’t tried to say much other than mama and dada so far. I am amazed at how clearly he understands language even though he cannot speak himself. I can ask him to get me a book, turn a page, clean up his toys or hand me the ball. When he eats I can point to the spoon full of food and say “you do it” and watch him pick it up and place it directly into his mouth. It is remarkable to watch the connection to language forming right before my eyes. I did have a question about sounds versus babbling. My son began making a growling noise around 7 months and still makes this noise from time to time when he is excited. Over the past week I have focused on giving him words when he makes this noise. For example, “are you excited,” “do you want to pet the kitty,” etc and I have noticed an immediate change in the frequency of this particular sound. I was wondering why some children make noises that would not be classified as babbling. Are they just testing out their vocal chords or is there another reason behind such sounds? I remember being so amazed by how much language Cee understood at this age, even though she actually used just a few words. Once she got pointing and head nods and shakes (yes or no) down, we could actually communicated a lot! Wow, so many fabulous questions here! The authors will probably choose about 5 to answer in our follow-up post, but I love reading all of these. And also, we will have to limit the giveaway to U.S. addresses. Sorry to my international readers – I always feel bad about this! Thank you thank you everyone for posting the things you’ve wondered about! I listen to audiobooks in the car when I’m driving (to preserve my own sanity), and my daughter listens by virtue of being in the car. Will this have any impact on her language development compared to listening to music or anything else? I’m aware that talking is the best way to develop language skills, but after a long day I just can’t talk for the whole drive home and then connect with her once we get there! My first son’s speech was advanced. The twins are more average, I think. I probably would get the answer reading the book but was wondering how to know when some intervention is needed. I have heard it is normal for kids to have some minor speech difficulties but not really sure until when or what constitutes “minor”. I am wondering if the same approach of language development that you wrote about should be used with chidlren with language delays or communication disorders. Great question… I would imagine that there are some specific strategies that can be used to facilitate language development without making it seem like a chore. This book sounds awesome! As a former psychology student, I’m so interested in children and their development – especially speech. I have 22 month old twins and the ped told me over and over twins are notoriously late talkers (especially boys) but mine have a huge vocabulary and are adding more and more words each day. It’s SO fun! Good question, and we have these kinds of conversations in the car, too. One thing I would say is that this is not playtime. When I’m asking Cee questions in the car, I’m not trying to take over her play or direct her towards a more learning-oriented activity. We’re just talking, and it many ways I take the lead because she usually won’t. Then again, I’ve noticed that when I’m quiet for a while, she’ll randomly break into song, which is pretty great too. My take on this would be that you’re probably a good judge of whether or not your child is enjoying the conversation. If she’s having fun answering your questions, then it’s probably a great use of time. If she’s feeling pressured to get the answers correct and isn’t enjoying it anymore, then it might be time to put on some music and relax. I’d love to read this book! I’ve wondered about reading to our daughter – will we get the same benefit regardless of what we read to her (e.g., chapter books vs. toddler books with just a few short words per page)? This book sounds fascinating and I’d love to own it. My husband and I are fascinated by all aspects of language in general (my fascination is also my work, and my husband often dreams of doing a second PhD in Linguistics..), but now that we have a baby, the interest has moved to a new level. Our son seemed to understand a couple of weekends ago each time my husband told him that if he ate his spaghetti, he would get a piece of clementine (and the promise worked every single time). He’s not yet nine months so we wonder how much his understanding was based on the verbal communication and how much on the context and body language – and is there any way one can really find out? Also, he hears about 5 different languages: we’re Indians with two different native languages, living in Switzerland (German and Swiss German spoken at his daycare), and we speak English with most of our friends. I remember that I could perfectly understand some languages that I never spoke just by hearing them on a semi-regular basis, so I wonder if my son will understand my native language even though I only speak it to my mom when we talk on the phone. Do babies who are raised in bilingual households speak later, on average, than other children? 1)I’ve been using synonyms with my 15-month-old. I’ll say “Can you pick up your drink?” and if she doesn’t respond, then “Can you pick up your cup?” or “Can you get your sippy cup?” or “Please bring me your water.” Or, we call dogs “Doggie” “dog” “puppy”, etc. Should I be using one word to describe something, or are synonyms/different ways of phrasing things okay? 2)Sometimes my daughter will learn a word, use it obsessively for about a week, and then stop using it. She learned “up”, spent a week or so repeating it as much as possible, and then she stopped saying the “p” part and would just yell “uuuuuuuh”, and now she’s gone back to just raising her arms above her head and shouting. Is this normal? Is it because we started recognizing the sign (arms above her head and shouting) and responding to that, so she doesn’t bother using her words? Our 18-month old daughter has global developmental delays, with no etiology determined. We were told by her developmental assessor that her expressive communication skills are typical of a 7-month old. She used to say 10 or so words, and she used 3 signs. Now we hear her say about 3 words and see her use 1 sign. It seems that pointing has taken over as her primary way of trying to express her needs and desires. My question: Are these two pieces of advice regarding “cave man” speak and no more reading well founded in language development theory and practice, and would you advise us in the same manner? Hi, I know this is an old post, and I’m NOT an SLP, but I wanted to add my two cents cents here in case anybody in a similar situation reads this in the future. I greatly enjoy reading literature regarding language development (haven’t read a lot focusing on delayed language, though), and I would be a little wary about the advice you were given, and maybe seek a second opinion. It can’t hurt! If your daughter enjoys listening to you read stories–I’d keep that up, and also add in more interaction (as suggested by the SLP) by pointing out pictures, labeling, etc. I think there are many ways to interact with books–and it’s great to mix it up! Regarding the “cave man speak,” my feelings are ambiguous. From what I understand, when toddlers have difficulty repeating words or combining them into phrases, modeling this type of telegraphic speech can be helpful. But I also remember reading (somewhere, at some point in time–I’m sorry I can’t cite it!) that toddlers’ comprehension actually suffers when parts of speech are missing. So while using incredibly complex sentences to communicate with your daughter might be confusing for her, I don’t think you need to leave out articles, prepositions, etc. all the time! Working with my grandson has been a totally different experience because I have definitely been drilling with a combination of sign language,pictures. and videos. just turned 2 and is speaking in sentences that are 3-5 words and has easily a 3-400 word vocabulary. he can play the drums quite well, thanks to my son. As a Speech Path, birth to 3 is the key to great language development. I grew up bilingual, but now English is my first language. I would like my 11 month old son to at least understand Hindi, so have primarily spoken Hindi to him since he was born. However, my own Hindi vocabulary is probably a mid-elementary level, and he rarely hears Hindi conversations. My husband speaks to him in English, and we speak English to each other. I was reassured to read in your review that language is developed, not taught, as I had this hunch but now am second-guessing myself. In my desire for him to understand Hindi, am I compromising his larger need to develop a robust English vocabulary and use? Because of the second-guessing, I find myself saying most things in both languages these days. Thank you for your blog and for introducing this book to your readers! This book sounds like exactly what I need. My 15 month old daughter is tongue tied (which can sometimes cause speech delays/problems) so I want to keep an eye on her language development. I just wasn’t sure what a good resource for this is (what’s normal, what to watch out for, etc.). I was excited to see your post on this today. I have a 3 1/2 year old who really WANTS to read. She’s always asking me to read signs to her. She is so proud of herself when she can ‘read’ something (like a stop sign or an exit sign, which we’ve sounded out a dozen times.) But in an entirely age-appropriate way, she gets frustrated fairly quickly with sounding out and deciphering. I’m really struggling with how much to support her desire to figure this out because I’m not sure whether it’s reasonable to expect her to be able to read yet and I don’t want to push her into something that is beyond her developmental stage. I sometimes wonder if she has adequate short-term memory yet to remember a bunch of sounds in sequence. I would love some suggestions. My not-yet-2-year-old has is very precocious in this area, with a vocabulary of many thousand words and extremely complex sentences. She uses subordinates and prepositions flawlessly. She always uses the appropriate verb tense, number and gender (Spanish speaker). She’s starting to master irregular verbs. She will regularly say things like: “The boy who was walking down the street yesterday was wearing his jacket because it was a bit chilly, maybe today he will wear it too since it’s cold as well”. Yes, she hasn’t turned two yet. I don’t do anything special at all, I just talk to her normally. Is there anything I can or should do to help her fulfill her potential?